Page 1 of 3. Displaying 20 of 47 products. Here at the Safe & Vault Store, it's our responsibility to make sure you're getting fully secure, high quality products so you can keep all your valuable items safe and locked away until you decide to access them again. From sturdy wall safes to custom locks for your gun safe, we have everything you could ever imagine to improve your property security at home or at the office. Our wall safes range from small models designed for jewelry or handguns, to fireproof wall safes for documents and cash, and all the way up to locker safes that can fit full-sized rifles (and anything else you want to keep protected). Wall safes are excellent for keeping valuable items hidden and secure inside the home or office. There are dozens of different safe products you can choose from, some of them featuring adjustable depths for custom installations which can add even more security. While any of these wall safes will protect your valuables, if it’s a safe you won’t be using every day, that isn’t in plain view of customers or guests, a concealable safe can provide yet another layer of security, since any burglar would have to find the safe before they can even begin to crack it! If you need to keep just a few small valuable items secure, a four-inch wall safe should do. But if you need additional storage security, going for a 20-inch deep wall safe is your best bet. It's entirely up to you and your safety needs. It's important to work with a trusted local contractor after you have made your purchase, however, to ensure that your wall safe is property installed between the studs in your home's walls. Why Safe & Vault Store? Our knowledgeable staff, along with competitive pricing and free shipping, makes for a sure-fire reason to contact Safe & Vault Store and find terrific wall safes and other products for all your storage and security needs. Give us a call today at 1-800-207-2259. "We recommend that you have a professional contractor or general contractor install the safe between the studs in your home thereby assuring that you will have a professional neat clean job." A home safe protects your valuables, but large, stand-alone safes take up significant amounts of space, and send a clear message to criminals that you have something worth protecting. An in-wall safe fits neatly into the dead space between your walls, and can be hidden safely out of sight. This type of safe does require more installation than a standalone safe, but the extra effort pays dividends. Easily mountable, the safe is designed to fit between the wall's two-by-fours, which are normally spaced sixteen inches apart. The average product has a depth of 3 1/2 inches, so the back of the unit doesn't protrude through the other side of the wall. If the wall backs onto dead space, such as a closet, the safe can be significantly deeper. 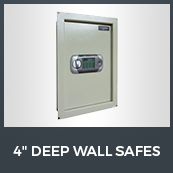 Wall safe height varies, but has more flexibility than the unit's depth and width. This allows you to choose a safe with multiple shelves, maximizing your storage space. Hidden or in Plain Sight? The ability to hide a safe behind a mirror or painting is a great advantage in a home safe. While some burglars may think to check behind wall hangings, most break-ins are quick, in-and-out affairs. After all, no crook wants to get caught, so they usually focus on items that are easily available. A hidden safe has another advantage. Potential thieves peeking through windows can't see it. This seems obvious, but a home safe in plain view indicates the homeowner has something of value, increasing the risk of a break-in. A safe may be designed to protect against burglars, fire, or both. A fire-resistant safe will have a fire rating which clearly displays how long the unit can resist high temperatures, with a highest possible rating of two hours. Choose a safe with a UL approved lock of Group 2 or better. Locks without UL approval are cheaper, but the money you save isn't worth buying an undependable lock. In addition, look for safes made from steel instead of sheet metal. Sheet metal is lighter, making safe installation easier, but much less resistant to burglary. Choose a safe with a 1/2-inch steel door and a 1/4-inch steel walls. Depending on your needs, your safe can open with a simple key, a combination lock, or both. Many units now use digital keypads or biometric information, such as fingerprints. Fingerprint-activated systems are recommended for any safe used to store firearms. Want to install this yourself? Watch this video on how to install a safe in a wall.